Don’t go live just to do it. You don’t want people watching you flounder live. Have a plan, rehearse it if you need to, and know what your goal is. People rarely want to watch a talking head giving them information so think of a creative way to show off your organization and the work you do. 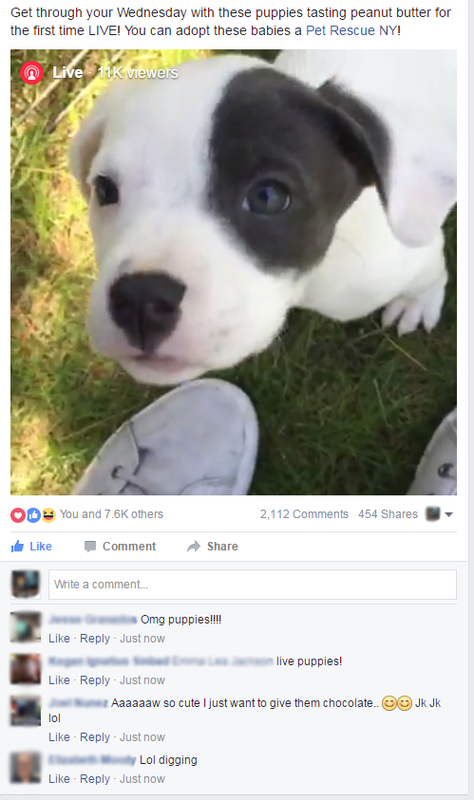 Thousands of people watched a livestream of several adoptable puppies eating peanut butter and then just running around with each other. Don’t have cute adoptable animals available? What about a tour of your facility? Interview some volunteers! Go live at an event and show everyone at home what they’re missing! Got a performance soon? How about giving your followers a peek at rehearsal? Before you hit the blue button, make sure your connection is solid. WiFi is usually the best option, but if you don’t have a nearby network, you’ll need a strong 4G connection. If you have weak signal, the ‘Go Live’ button will be grayed out and a bad connection or slow speed will make your video glitchy or even drop it all together. #4 – Interact – it is social media after all! Facebook Live allows for watchers to make comments, ask questions, and express emotions on your video in real time. Keep an eye on what people are saying and answer any questions they have. In fact, soliciting questions or even asking the audience questions is a great way to interact and keep them interested. If your first try at going Live isn’t everything you thought it would be, don’t fret (during #NTxGivingDay’s first Facebook Live, our videographer fell!). Take a step back, evaluate, and plan your next one.